Are There Different Types of Products? What are the Important Purchase Considerations? How to Apply Tire Shine? How to Make Tire Shine Last? Detailing tires often gets overlooked, probably because it’s the last step in the process. While dressing tires may be the LAST step in detailing, black glossy tires are often the FIRST thing people notice when looking at a car. In fact, there is a strong argument that tire dressing provides the biggest bang for the buck in car detailing. If you want your car to look like it just rolled off the showroom floor, you absolutely must use a quality tire shine. What is the best tire shine product? The answer is not straightforward as this is a VERY competitive niche. We have reviewed the cream of the crop to help you make the PERFECT decision for both you and your car. In our roundup of the top 14 tire shine products of 2019, we looked at everything from cleaners that provide a “new car matte” look to specialized tire dressings that offer a full “glossy wet” look. We also considered a wide range of product application types: sprays, gels, aerosols and concentrates. Our review definitely has something for every taste and preference. Here are our top picks. While these are our top picks, there are several other outstanding products including those from TriNova (Best Value) and Aero Cosmetics (Best UV Protection) to name a couple. Shine: Controllable. Size: 18 ounces. Applicator: Spray. Base: Water. Model #: TSS-18OZ-KIT. Why is it our Editor's Choice? You can control the shine from a satin matte to a more wet look. It is dry to the touch and not messy. Its water based formula is safe for both your tires and the environment. It gets rocking reviews and is made in the USA with top notch customer service to boot. With great reviews, a long history, and an included applicator, Car Guys Premium is a tire shine product that has it all. Premium Tire Shine is designed to please the largest range of customers possible. It is a medium thick, medium shine product. Complaints about “sling” (getting product on your paint while driving) are less than 2%, which is excellent for this product category. It is also dry to the touch with a low mess factor. Simply clean the tires first, spray 2-3 squirts onto the applicator and rub into the tire. Use additional product for more shine. A few complaints about the spray mechanism (<2%). Shine: Controllable. Size: 18 ounces. Applicator: Spray. Base: Water. Model #: CARF-C307. It's a virtual clone of our other Editor's choice. Controllable shine, low mess, easy to use and made in the USA with great customer service. These two products are neck and neck. Carfidant Tire Shine Spray is a newer product on the market. It also gets the absolute best customer reviews in the segment. 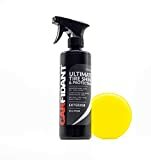 Carfidant uses a patented nano-polymer formula that protects against UV radiation, salt and road grime. Like our other best product, the shine is controllable. Newer brand and not as established players like Adam’s, Car Guys, Meguiar’s, etc. Shine: Satin matte. Size: 16 ounces. Applicator: Gel. Base: Water. Model #: SPRVRT. 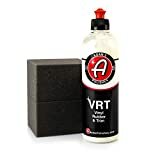 Adam’s VRT is a premium brand and is the highest rated gel product in our review. Why is it our Best Gel? It's a high end product that gets fantastic reviews. Restores tires to a new tire (vs. wet) look. Provides top notch UV protection and can be used on any rubber, vinyl or plastic. Super clean and not messy, Adam's VRT was a strong contender for best overall. Adam’s uses a special formula that provides a robust SPF 35 UV protection. The finish provides a “new tire” look and is NOT super shiny. Lack of any noticeable odor. Lasts decently long time for a water based product. Here is a video from Adam Pitale himself describing VRT tire dressing. Shine: Wet. Size: 14.5 ounces. Applicator: Aerosol Foam. Base: Refined oil. Model #: TVDSPRAY101. Why is it our Best Aerosol Spray? Two things stand out about this product. It is super fast and easy to apply, and it provides a really wet black finish. If you have knobby, off-road tires, foam is the best as it does a better job of penetrating the crevices. Can be messy and get on your rims, but a great product nonetheless. 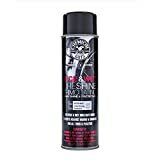 Chemical Guys is a very well known brand in the detailing market, and their Nice and Wet is the highest rated aerosol spray product in our review. Nice and Wet sprays on as a foam. It’s super easy to apply. Spray it on, let it dry and wipe off with a microfiber cloth. You can even skip the wipe down for a wetter look, although we do not recommend that (will sling onto your paint). Essential oil based formulation is less environmentally friendly than water based. Check out the manufacturer video here. Shine: Satin Matte. Size: 16 ounces. Applicator: Spray. Base: Water. Model #: 767P. Why is it our Best UV Protection? Designed for aircraft and certified by Boeing, this is truly a top quality product. Makes tires look like brand new rather than shiny. It simply provides the best UV protection on the market. Made in the USA. Very attractive price per ounce for a product of this quality. Aero Cosmetics is rated for the aviation industry and is excellent for cleaning and restoring rubber to a new look. Its triple nano polymer formula provides excellent UV protection. Longevity is among the best for a water based product. Shine: Controllable. Size: 18 ounces or 1 gallon. Applicator: Concentrate. Base: Water. Model #: 33511 and 33532. Why is it our Best Value? The 1 gallon size is a whopping 70% cheaper on a price per ounce basis than our Editor's Choice products. Otherwise the product is very comparable. Controllable shine, easy to apply and a gentle water based formula. It is also made in the USA and has top notch customer service. Cited as a top product by many reviewers and enthusiasts, TriNova frequently wins “best of” awards. TriNova’s claim to fame is that you can spray on ONE application, let is soak for a while and get a VERY wet and dark gloss (wipe off after 15 minutes for a more medium shine). TriNova Tire Shine has advanced coatings that provide a high shine while protecting against fading, cracking and yellowing. One cool feature is that the shine is highly controllable. Anything from a medium finish to completely glossy and wet is possible. Some feedback that application can be blotchy without a thorough wipe down. Shine: Wet. Size: 18 ounces. Applicator: Gel. Base: N/A. Model #: 77960. ArmorAll Extreme Tire Shine Gel is in the same ballpark as more upscale brand names. It’s just much cheaper and can be found for less than HALF the price of other leading products. Despite being cheaper, it even comes with an applicator sponge! A true wet look and good longevity make this product definitely worthy of your consideration. Armor All has been around forever and has historically been associated with sticky dash and seat protectants. Not anymore. Good longevity at 2-3 weeks plus. Product not as dry to the touch as higher end gels like Adam’s or Meguiar’s (some complaints about it being messy). Shine: Satin Matte. Size: 8 ounces. Applicator: Gel concentrate. Base: Water. Model #: ST8. Why is it our Best High End? As a concentrate, it will last much longer as only a few drops of product is required for most tires. The shine is more a satin, new tire look than wet gloss. Shine Society Tire Shine is very versatile. It can work on any surface short of paint or interior fabrics. Not capable of a really high gloss wet shine if that is what you need. Black Magic Tire Wet Foam is another spray foam at a price per ounce that is tied for the lowest among the 14 products we reviewed. Unusually, for a spray foam, it is water based. It is marketed as a “one step” product. This means that you don’t have to clean the tire first and then spray on the shine separately. Spray it on, let it sit for at least 10 minutes and wipe off the excess. Decent longevity compared to water based competitors. Gloss doesn’t last as long as solvent based sprays. Chemical Guys Silk Shine Tire Dressing is a water based tire shine similar to our two Editor’s Choice products. It’s a very good offering, BUT it has a lot of competition. Clean modern matte finish. Dry to the touch. UV protection. Use on all vinyl, plastic and rubber surfaces. 18 ounces. Less durable in rain and inclement weather. 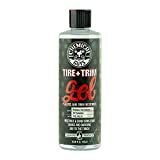 Chemical Guys Tire & Trim Gel is something of a different animal. Its base is a refined oil that is less harsh than most solvent based tire shines. Deep glossy shine. Dry to the touch. UV protection. Use on all vinyl, plastic and rubber surfaces. 16 ounces. The result is a deep dark wet shine that lasts longer than water based shines and is less toxic than traditional solvent based tire dressings. Works better on black plastic and vinyl as opposed to greys or other colors. Griot’s Garage V&R Tire Dressing is a solid offering from the famed Griot’s line. It is an excellent product that could have easily garnered our Editor’s Choice award. 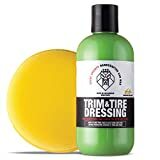 Griot's Garage 10981 Vinyl and Rubber Dressing - 22 oz. This water based spray provides a new car, matte look as opposed to a super shine. It is a very versatile product that can be used on your car’s interior as well. Trusted and well established brand. Some people have had problems with the spray pump. Meguiar’s is a huge brand in the car care and detailing segment and has been in business for over 115 years. 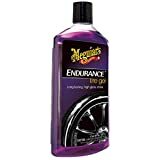 Their Endurance Tire Gel exemplifies the quality of the Meguiar’s line. Deep glossy shine. Advanced polymer formula. Gel base prevents overspray. 16 ounces. Provides a very glossy and black shine on par with Aerosol sprays. Advanced patented formula prevents tire cracking and browning. The Endurance Tire is an excellent product and is very close to Adam’s VRT (our best overall gel). Trusted brand with the longest track record in the market. Average longevity (~ 1 week depending on conditions). This Meguiar’s product is an aerosol spray as opposed to a gel. Its calling card is a super glossy, black shine. No satin matte look here. High glossy shine. Dry to the touch. Aerosol spray. Protects against browning and cracks. 15 ounces. It is considered to be a spray on, “no wipe” tire shine. However, if you overspray, it will sling to other parts of your car. As with any of these products, applying to a clean tire is a must. Will sling when over sprayed. We have covered a large number of tire shine products. Here is summary so you can see the relevant information in one glance. Tire shine products can be characterized in how they are applied (e.g., spray, foam) and how they are made (water or solvent based). Spray. Tire shine in spray bottles is the most common product form on the market, and among the most expensive. Sprayable liquid is much faster to apply than gel or concentrate. However, you have LESS fine-tuned control over how much product is used. That can require more wiping down to avoid dripping or slinging. Aerosol spray. This is the fastest method of applying tire shine. Some have argued that the chemicals to suspend the solvent in aerosol form will harm tires over time. However, tires are manufactured to be extremely tough. Aerosol shines are on average the cheapest available. Gel. Control is the key word here. Gel products are applied first to tire shine applicators and then massaged into tires. This allows users to tweak both the amount used and the level of shine. The downside is that the process usually takes longer. Concentrate. The least common form is concentrate. With the consistency of thick hair conditioner, concentrates require only a tiny amount of product. Beyond that, they work similarly to gel products. Not surprisingly, they are the most expensive per ounce. Base. The product base comes in two types – water and solvent. Solvent base. These tire dressings contain carbon and silicone in a slow evaporating solvent solution. Typically, they require applying think layers of dressing and using a sponge to get an even shine. Water base. With these products, silicone is homogenized so that it can be suspended in water. While these are gentle products, the shine produced does not last as long. The main benefit of all tire shine products is that it makes your tires look clean and shiny. This can be anywhere from a glossy satin to a “straight from the car wash” wet look. Most products also have protectants as part of their formulations. UV inhibitors prevent the sun’s rays from breaking down rubber which causes cracks and brown discoloration. Beyond that, solvent and water based tire dressings have relative strengths and weaknesses. Create a glossier and wetter shine. Layer on more smoothly (especially the best water based tire dressings). There are cons as well. Some products require a lot of elbow grease to get an even shine with no runs. Type of Base. We just walked through in detail the differences between solvent and water based tire dressings. If slinging and environmental friendliness are important, choose a water based product. If water resistance and durability are important, go the solvent route. UV protection. Ultraviolet radiation damages virtually all car accessories from tires to dashboards. If you park outdoors full time and live in sunny climates, consider the highest rated UV product available. Price. Even quality products usually cost under $20. However, that masks a huge difference in price per ounce. The range in our roundup of products was 7x. The lowest was 25 cents per ounce, and the highest was $1.87 per ounce. If you only have 1-2 cars, this may not be a major concern. That said, every penny counts. Look. Shines range from a clean but dull “matte” look to a completely “wet” look. All product descriptions provide some indication of the final look. A quick scan of the reviews will help verify the veracity of manufacturer claims. It is worth noting that our two Editor’s Choices have a “controllable” shine. The more product you apply, the wetter the look. Amount of Work. Sprays usually require less work than gels, although there are exceptions. Regardless of the application method, some products require multiple coatings and more wipe downs to avoid splotches and streaks (i.e. to get an even shine). Longevity. Some products last longer than others. Longevity depends hugely on how and where you drive; whether or not you have a garage; what the weather is like; etc. That said, 2-3 weeks with the shine slowly fading is a decent rule of thumb. Brand. Reputation and brand are earned from years of good performance. Car Guys, Chemical Guys, Meguiar’s, and Trinova (among others) are well established and have proven track records. Not all tire shine products are the same. There are sprays, aerosol sprays, gels and concentrates just to name a few of the different forms. Read your instructions CAREFULLY. The two biggest complaints about tire shines are “sling” and that the shine doesn’t last long enough. Both of these issues are significantly worsened if the product is applied incorrectly. A generic tire shine process looks like this. Wipe with a damp towel. Complete cleaning by wiping with a dry towel. Note: some products are “one step” meaning they clean and shine all at once. Even in those cases, you are usually better off to clean your car tires first. Tires that have been driven for a while have layers of black film. The film is the result of road grime, old tire shine, grease, and basically anything else that will stick to a tire. If these layers are not removed, any new tire shine will not be able to bond to the tire. The result is that any newly applied product will only last for a few days. Thoroughly clean your tires with a tire safe cleaner. Once that is done, apply your preferred tire shine product. Not only will you get a better quality finish, it will last longer as well. This video from Chemical Guys walks through the details. There are only a few accessories that you need to worry about. The main ones are tire cleaners, tire shine applicators (if not included with purchase), microfiber cloths and possibly, spray bottles. Some manufacturers provide tire shine applicators with any purchase of their product. Our Editor’s Choice, Car Guys Premium, is an example. Other manufacturers sell specific tire dressing applicators tailored to their product. Adam’s and Chemical Guys are examples. Here are some of the best available. Like wearing high quality shoes with a nice suit, a good tire shine completes your perfectly detailed car. The fact that it protects your tires and helps them last longer are just added bonuses. If you have been wondering what is the best tire shine product, hopefully this roundup answers all your questions. The most important considerations are what type of shine do you want, how to avoid “sling,” and do you prefer a water or solvent base given their known tradeoffs. Keep those factors in mind, and you will find the BEST tire shine product for you and your car. How long does tire shine last? What is the type and quality of product used? How good of a job was done applying the product? Do you park in a garage? As you can see, there are many relevant factors. If you put a gun to our head, we would say 2 to 3 weeks is likely for average drivers with the shine slowly fading over time. What are some of your favorite tire shine best practices? First, always try the product on a small area to make sure it provides the result you want. Nothing is worse than doing a bunch of work and being both disappointed AND tired. Also, invest in buying a rubber safe cleaner and thoroughly clean the tires first. This makes everything go better: ease of application, quality of shine, longevity, etc. Can tire shine be used on plastic and vinyl accessories like bumpers and trim? Manufacturers are very specific about when their product has multiple applications. Read the fine print! 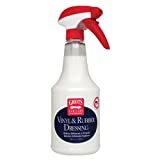 As a rule of thumb, almost all water based sprays and gels are gentle enough to use on almost all car surfaces barring paint, fabrics and glass. Can tire shine be used on rims? Again, most shine product won’t hurt rims. It is made for tires after all. Some splatter is all but given. However, we always recommend buying dedicated wheel and rim cleaners. They are very affordable and do the job quite well. Can tire shine be used on off-road tires? Of course. However it is extremely difficult to get into the nooks and crannies on knobby tires. Aerosol spray foams seem to work the best. Thick gels that require spreading on by hand are the least effective in our opinion. Something like Chemical Guys Nice and Wet Tire Shine would probably work the best. Will tire shine products harm car paint? Generally speaking, no. You should, as a rule, keep any engineered substance from coming into contact with car paint if it is not specifically made for that purpose. Water based solutions in particular are safe. Solvent based solutions can damage paint and tires with repeated exposure. However, if a small amounts splash onto paint and are quickly wiped away, the damage should be miniscule. What does “tire shine no sling” mean? Tire shine products have silicone and other protectants in them. If applied too thickly or not rubbed into the tire, the product can be thrown onto car paint, rims and the fender wall when driving. So “tire shine no sling” is car lingo for a product that stays on the tire once applied. What are customers’ most common complaints about tire shine? Product freezes and becomes useless. The good news is that these issues are usually cited by only 2% to 4% of customers depending on the product. Most are caused by not following instructions. Regardless, that is a very strong performance profile. Is it possible to make a homemade tire shine? Take any car product and there is always some intrepid consumer who wants to try a homemade version. While a DIY tire shine is absolutely possible and in the spirit of full disclosure, we only use branded products. After surveying the internet, people have tried castor oil, lemon oil, baby oil, coke, etc., to make a homemade tire shine. Castor oil seems to be the most common ingredient in DIY tire shine. Check out this video for a representative mixture. It is fair to point out, that the DIY approach is not necessarily cheaper and looks to be more expensive in many cases. 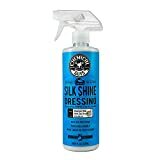 What accessories do I need in addition to tire shine? The list is pretty straightforward. Some people with allergies or sensitive skin may find gloves helpful. Should you always clean tires first? Will tire shine harm raised white letters on tires? No, manufacturers are acutely aware of all types of tires their products are used on. Very few, if any, problems have been reported about this. Why are aerosol sprays still sold? The trend is definitely toward water based spray tire shines. At the moment aerosol spray foams still have a niche. The work well for tires where that have grooves or notches where gel cannot easily penetrate. Couple that with the fact that they are much cheaper and they still have a foothold in the market.